Humanism and cosmopolitanism are recent debates in Turkish history, in contrast with that, both have been familiar to the Western societies since the Italian Renaissance. The first Turkish author to call himself as a citizen of the world, which is the literal meaning of the word "Cosmopolitan," was İbrahim Şinasi, the pioneer poet of Tanzimat modernism. However, cosmopolitanism has always been a minor approach within the Turkish intellectual circles. The Turkish "citizens of the world" mostly emerged from families of diplomats, translators and merchants with commercial ties with Europe, mainly with France. The Kabaağaçlı family is a good example of the Turkish humanists or cosmopolitans. Having had military backgrounds, the late Ottoman elders of the family took high rank posts within the Ottoman State. Cevat Pasha was one of the grand viziers of Sultan Abdulhamid II, while his brother Şakir Pasha was a diplomat. Especially Şakir's family dealt with fine arts, which have been gates to European culture in Turkey. Two of his daughters, namely Fahrelnissa and Aliye were modernist painters, while his son Cevat Şakir, a popular writer known as "Fisherman of Halicarnassus," became one of the most peculiar defender's of humanism and cosmopolitanism in Turkey. Besides, some of Şakir Pasha's grandchildren have dealt with arts such as painting, ceramics, theater, et cetera. Among all of the artists coming from the Kabaağaçlı family, Fahrelnissa Zeid is the most known one in the world thanks to her large-scale abstract paintings and her life in Europe as a princess, being the spouse of Prince Zeid al Hussein of Iraq, son of Faisal the King of Iraq before the military coup of General Qasim in 1958. Fahrelnissa Zeid was born "Fahrünnisa Şakir" on Jan. 7, 1901 in Büyükada, Istanbul to an elite Ottoman family. Her father Kabaağaçlızade Mehmet Şakir Pasha was appointed as the Ottoman ambassador to Greece. Şakir Pasha married Sara İsmet Hanım, whom he met in Crite during his duty. Fahrelnissa's uncle Cevat Pasha was the grand vizier of the Ottoman state from 1891 until 1895. When he was dismissed and exiled by the Sultan, his brother Şakir felt resentful against the Sultan and refused a mansion in the Bosporus and moved to Büyükada, which is the biggest of the Princes's Islands in the Marmara Sea. He lived in seclusion in the Büyükada with his children, who he encouraged to deal with fine arts and reading. In 1913, an unfortunate incident happened and Cevat Şakir, the elder brother of Fahrelnissa, killed his father accidentally. After that, Cevat Şakir was charged and prisoned, while his mother and his four sisters including Fahrelnissa and Aliye had to struggle with difficult conditions. On the other hand, little Fahrelnissa took the chance to get a proper art education in the first Ottoman conservatory. She was fond of drawing and painting from her early childhood, and her family supported her education in spite of the tragedy they lived. Fahrelnissa married İzzet Melih Devrim, a minor poet and novelist, in 1920, when she enrolled at the conservatory for girls. İzzet Melih took Fahrelnissa to Venice during their honeymoon, which was an opportunity for her to see actual works of the European fine arts. Fahrelnissa and İzzet Melih stayed married until 1934 and had three children. The first one very early, while Nejad and Şirin became artists like their parents. Nejad was a painter and Şirin was a stage actress. In 1928, Fahrelnissa visited Paris and received education at the Academie Ranson. Fahrelnissa divorced İzzet Melih in 1934 and married Prince Zeid bin Hussein, then the Iraqi ambassador in Berlin. She moved to Berlin and became a popular figure within the diplomatic society in Berlin. After the World War exploded, the couple moved to Baghdad, but Fahrelnissa couldn't put up with the social differences between the East and the West in Baghdad and moved to Paris after a while. During the World War II, she spent her time in Paris, Budapest and Istanbul, the latter being her hometown but not her final destination. Zeid became a part of the D Group, a group of avant-garde painters in Turkey, and opened her first solo exhibit in Istanbul in 1944. That period is generally referred to as her first period of artistic creation and labeled with miniature-like paintings. Her works showed major influences of the Turkish classical painting, Byzantine mosaics and European avant-garde. In 1946, Prince Zeid became the ambassador of Iraq in London. So, they moved there and Fahrelnissa began painting in a geometric and abstract design after holding several solo exhibitions in Istanbul. She found a great opportunity to make friends with other artists and critics in London and Paris during the 1950s. 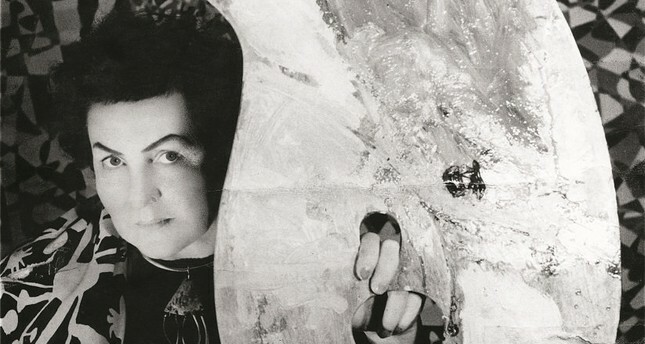 Until the military coup in Iraq in 1958, the couple lived a modern fairy tale life and Fahrelnissa could concentrate on her large-scale abstract works. In 1958, the military coup changed everything for the Faisal dynasty as their kingdom was overthrown and many family members were killed. Prince Zeid was allowed to live in London without any royal title or riches. Zeid rented an apartment in London and they began to live a very humble life, which was not unfamiliar to Fahrelnissa as she lived in noble poverty in Istanbul after her father's tragic death. The Zeids would receive a royal title from the Jordanian dynasty. Hussein and Fahrelnissa's son Raad is officially recognized as "Prince" and called "His Highness" in Jordan. He moved to Jordan in the 1960s, followed by his mother in 1970 after his father's death. Fahrelnissa Zeid became a prominent figure in Jordan after her arrival thanks to her being a modern artist recognized by Western artistic circles. She taught art in Jordan and established the Institute Fahrelnissa Zeid of Fine Arts, which she ran until her death on Sept. 5, 1991. Beginning in 1990, her works were exhibited in significant galleries in such cities as London, Paris, Istanbul and New York.